Formosa Plastics Group, the largest industrial conglomerate in Taiwan, still remains committed to the construction of the mammoth integrated steel mill in Vietnam, despite the Vietnamese government’s rejection of a special economic zone designation for the project. 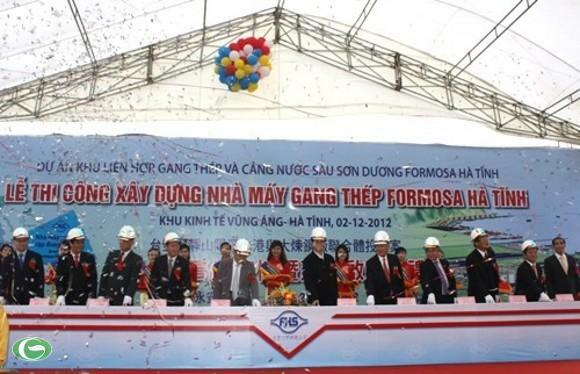 The launching ceremony of the Formosa Steel Project in Ha Tinh Province in 2012. The Taiwanese firm is now the largest foreign investor in Vietnam in terms of the investment capital, based on its US$10 billion steel integrated mill and deep-seaport in the Vung Ang Economic Zone in the central province of Ha Tinh. In additional, the firm has also invested US$900 million in the southern province of Dong Nai for manufacturing yarn and polyester fibers. A source at Formosa, who declined to be named, said as of early last week, Formosa had disbursed around US$4.2 billion into the steel project. “Some unexpected things have happened, but everything is fine now. We’ll continue with construction,” said the source, adding that despite the Vietnamese government’s rejection of Formosa’s proposal to establish a special economic zone covering the entire site of its project in Ha Tinh, the Taiwanese investor remained committed to Vietnam. The Formosa project in Ha Tinh covers an area of 2,000 hectares. This is the firm’s first steel manufacturing project in the country, which will eventually boast an annual capacity of 7.5 million tonnes. The Taiwanese industrial conglomerate sent the Vietnamese government a proposal in May asking for support after thousands of locals attacked Formosa’s construction site as part of anti-Chinese riots. In addition, the company also proposed the establishment of a special economic zone solely for its mammoth steel and seaport complex in the Vung Ang Economic Zone. According to the Ministry of Planning and Investment, Formosa currently benefits from the highest incentives possible under the country’s laws related to imported raw materials, machinery and equipment. Two weeks ago, Formosa also received US$2 million from insurance companies in compensation for the damage caused during the riots in May. “We feel more confident following the government’s reaction following the riots,” said the source. Formosa is now considering expanding investment in Vietnam in power, as well as in garments and textiles. “This plan will be gradually implemented in the coming years,” the source said. Late last year, Taiwan’s Taipei Times quoted president of Formosa Industries Corp Hong Fu-yuan as saying that the group would spend US$100 million to build a 200,000 tonnes polystyrene factory in Dong Nai. The factory will serve a growing demand for polystyrene packaging in Vietnam as electronic and home appliances companies flock to the country. In addition, Formosa will spend US$400 million to build a co-generation power plant to increase the capacity of its yarn-making, polyester fiber, and biaxial-oriented polypropylene factories in Dong Nai. If the investment expansion is implemented, Formosa will remain one of Vietnam’s largest foreign direct investors.